I don’t even know what an autumn equinox is, nevermind what one should eat on such an occasion. So, prompts be damned, I’m reviewing another full English breakfast! This is truly one with a twist, though: the Raw English Breakfast from My Raw Cafe, right in the heart of Prague. After my last encounter with a raw breakfast, this was quite a gamble. But it definitely worked out better this time around. The dehydrated aubergine crisps in the front left corner look so inviting. Alas, they were too soft and difficult to chew through – in no way as crisp as they looked. 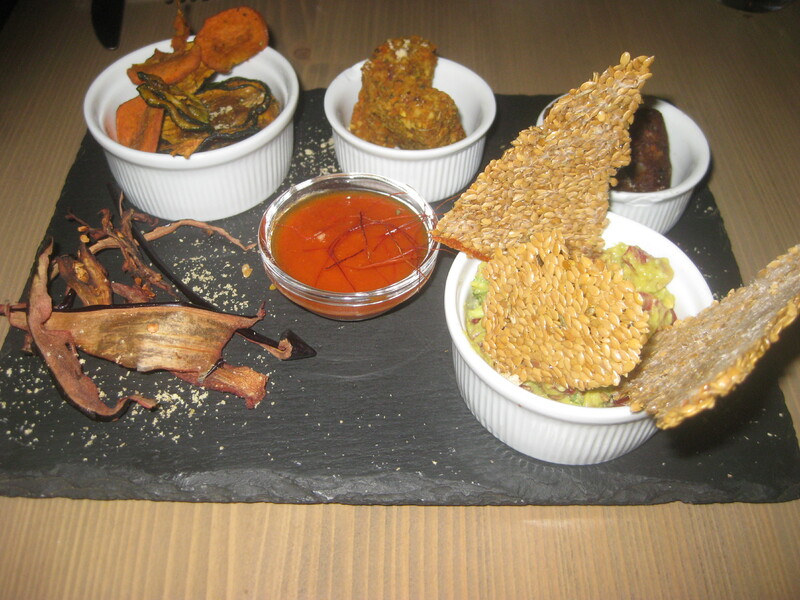 The courgette and pumpkin rounds in the ramekin behind them were better and still had a great flavour, but also weren’t as crisp as I would have liked – is it possible to get raw food crispy? Still, they were delicious with the spicy tomato dip in the middle, whereas the aubergine was inedible. In the middle was what we dubbed ‘the potato substitute’: tasty, crunchy bites of Brazil nuts, tomato and herbs (and probably lots of other things we couldn’t identify). And in the back right corner were the tiny little sausages, full of sun-dried tomatoes and flavour. These were my favourite part of the dish, they were good and chewy. 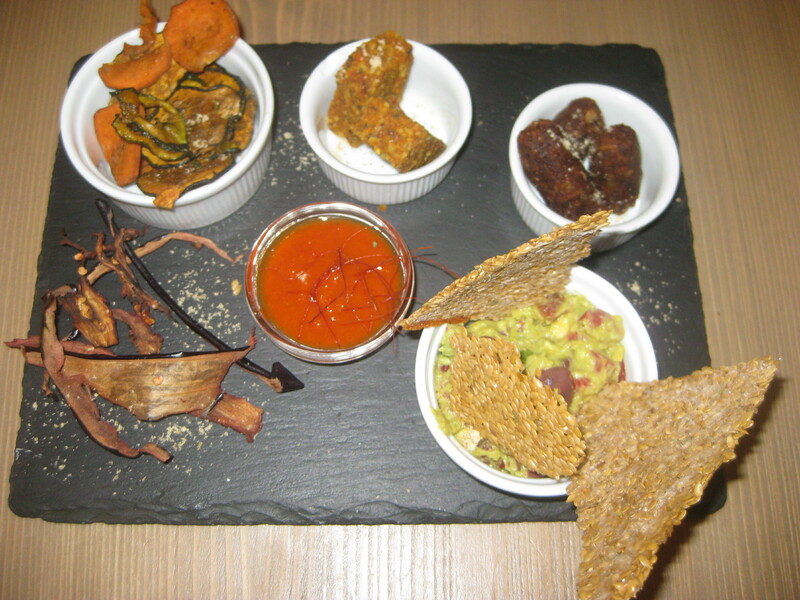 And right at the front was the ‘scramble and toast’: guacamole and seedy crackers! There were olives in the avocado scramble, and it was really cool and creamy. The crackers were crunchy and good. All in all, besides the aubergine, it was a real hit and has restored my faith in raw breakfasts! The drinks menu was great – lots of smoothies and shakes. I went for the vanilla hot chocolate, because, well, I must. 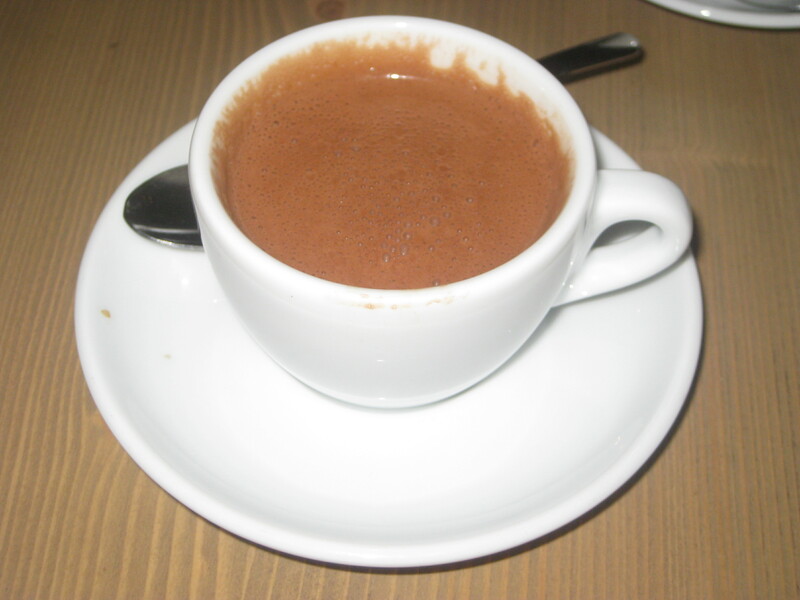 It was a small cup, but it was rich and sweet, and I loved it. My Raw Cafe was a great find in Prague, with an excellent array of cakes and a tempting menu for the rest of the day too. I’ll definitely be back for more! This entry was posted in Travel, Vegan Mofo and tagged My Raw Cafe Prague, vegan breakfast, vegan mofo, vegan Prague. Bookmark the permalink. Wow, that definitely deserves full marks for creativity. I would love to try something like this. I love it when places try something a bit different! that’s definitely an interesting take on a breakfast – I’d be keen to give that a go. I went there last time I was in Prague and the cake was phenomenal. We may have had a slice of cake for breakfast dessert as well – the cake counter was too good to ignore!